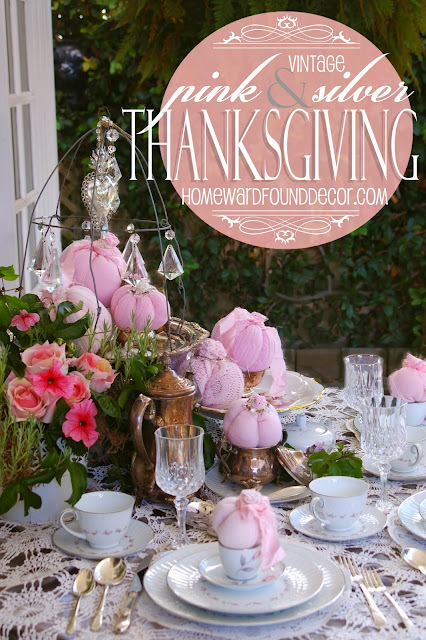 a Pink & Silver Thanksgiving Table! her china pattern has little pink rosebuds on gray stems with gray leaves. they serve to pull out the gray leaves in the patterns and highlight the silver plate rim. to create a sparkling multi-level centerpiece for the table. Some cuttings of passion vine and rosemary from the garden pair with pink petunias and roses. Want to make your own wire dome from a two dollar tomato cage?! Click here for my tutorial! Over a pewter satin tablecloth, I laid a light-weight white crocheted lace tablecloth. The contrast of the dark color underneath really makes the lace details pop. Napkins are simple pewter satin. with a silver plated rim, gray leaves, and pink rosebuds. appears in the espresso cups & saucers, and several of the serving pieces. Floral-motif antique silver flatware and cut crystal glassware brings sparkle to the neutral setting. wrapped around a rolled satin pewter napkins. and a crystal ornament tied on. in a miniature espresso cup. It's an idea easily replicated with a real pumpkin, a chocolate pumpkin, or a candle. Very sweet, Deb! Happy Thanksgiving! !